When you’re getting started, Kendo doesn’t require much equipment. A bokuto (wooden sword – also referred to as a bokken) is what you’ll need to start your Kendo training at the Niagara Kendo Club. 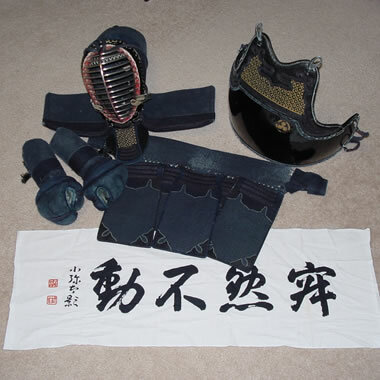 Uniforms consist of a top (gi) and bottom (hakama) and can be purchased when you decide to commit to Kendo training. You will need a shinai (bamboo sword) or two when you start striking drills. New students can borrow club bokuto and shinai for a while, but after a month or so you’ll probably want to order equipment. Average equipment costs for the basics (bokuto set, two shinai, shinai carry bag, uniform and a backpack for uniform & other equipment) is approximately $180. Armour (bogu) will also be required when you start advancing into striking drills. You can purchase a set of your own starting at around $450 for a decent set. The club also has several sets available for rent at a reasonable monthly fee.